In 2003 Paul Bahn led the team that discovered the first Ice Age cave art at Creswell Crags in Britain. 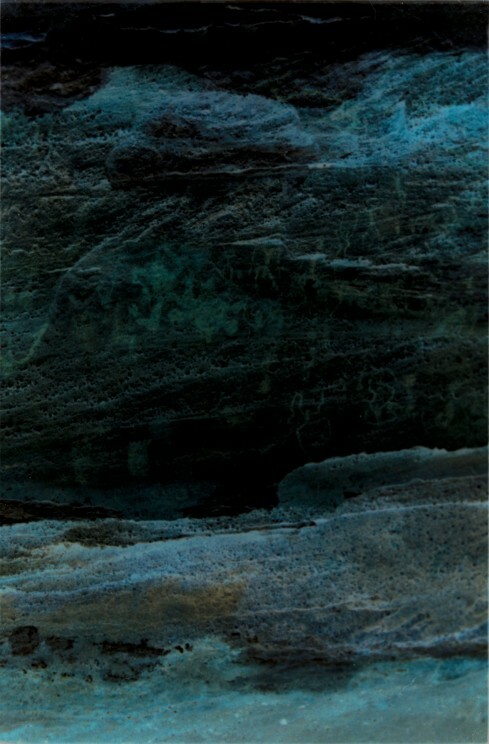 In recent years, many more discoveries have been made including the expanding phenomenon of ‘open-air Ice Age art’. Information gathered from advanced dating methods have revolutionized our knowledge of how cave art was created and when it was created. For instance, we now know that the art found at Creswell Crags must have been created at least 12,800 years ago. This may seem like a long time ago, but other examples of cave art date back 40,000 years. In the slideshow below, you can see some of the earliest examples of art on the planet, and take a tour of prehistoric art throughout the world. Mammoth, c.10 cm long, engraved on a fragment of megafauna bone, Vero Beach (Florida), date unknown. When first revealed a few years ago, it was widely suspected to be a fake, but microscopic and chemical analyses have not been able to challenge its authenticity. Photo courtesy of P. Bahn. Small red human stick figures exposed on the back wall of Toca do Baixão do Perna rock-shelter, Brazil, by excavation of the layers which had covered it. Though faded, the images survived burial amazingly well. One fragment of charcoal still adhering to the panel gave a radiocarbon date of 9650 years ago, while charcoal from the layer touching the bottom of the panel has been dated to 10,530 years ago — hence, unless one envisages artists painting at nose level while lying on the floor, the panel must be somewhat older than this date. 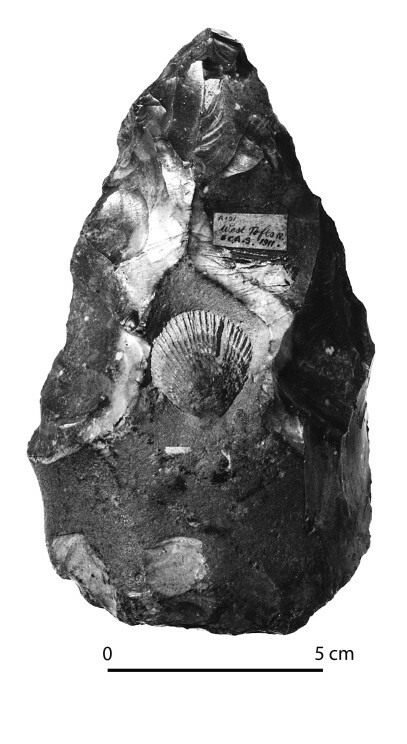 This handaxe, c.13.5 cm long, found in 1911 at West Tofts in Norfolk, England, and probably several hundred thousand years old, was carefully made so as to preserve a fossil shell of Spondylus spinosus at its centre, indicating the existence of a keen aesthetic sense at this time. Photo courtesy of P. Bahn collection. 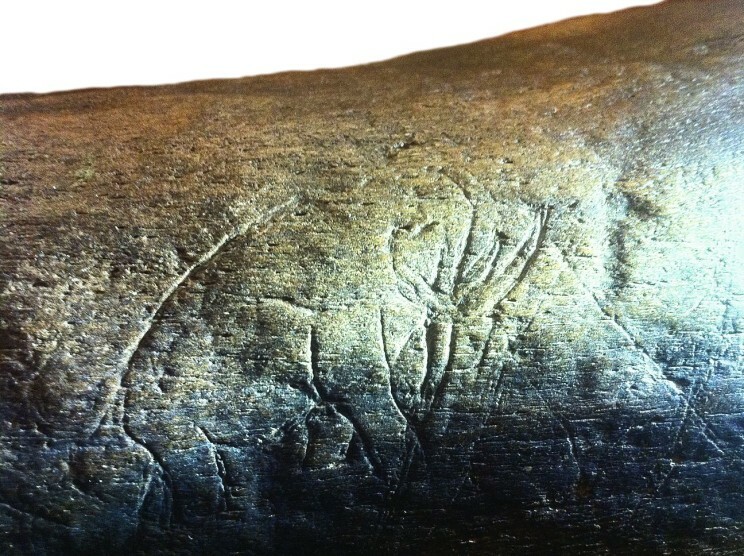 One of the most important new developments of recent years has been the discovery that open-air Ice Age pecked and engraved figures can survive in certain environments — not only in Europe but also in Egypt, particularly at Qurta, in the Edfu region — where pecked images of aurochs, hippos, fish and birds have been found, as well as some Gönnersdorf-style females. 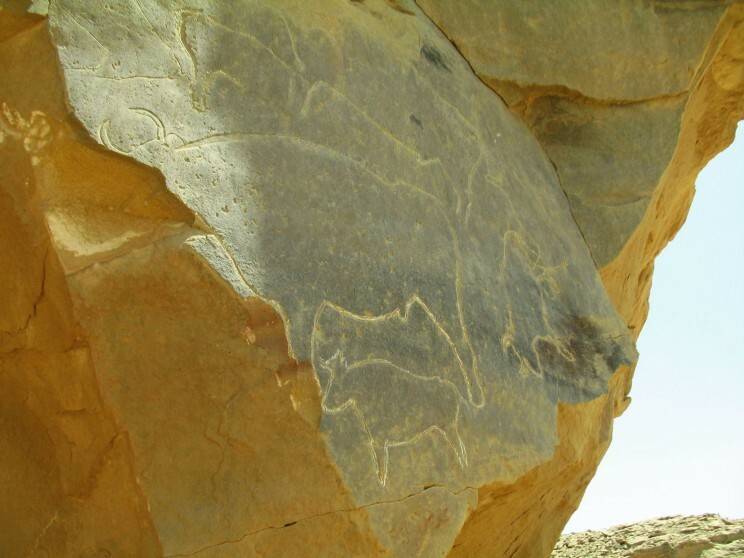 OSL dating of sediments covering some petroglyphs at Qurta has proved that they have a minimum age of 15,000 years. These discoveries triggered searches elsewhere, and rapidly led to new similar finds, for example in the Aswan region. 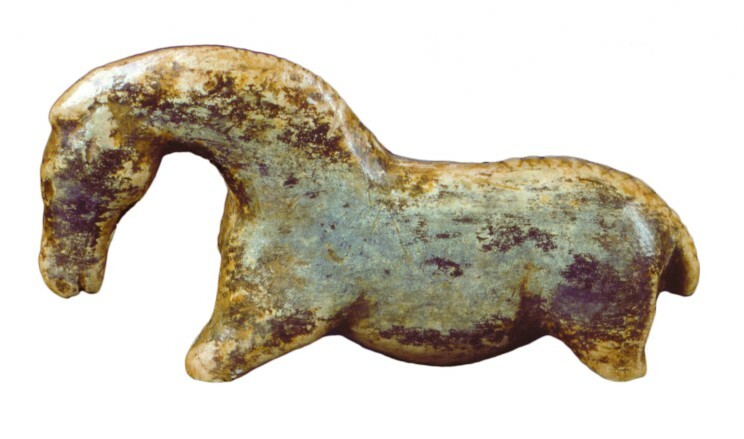 The horse from Vogelherd, Germany, carved from mammoth ivory. Less than 5 cm in length, it is widely thought to date to the Aurignacian period (i.e. more than 30,000 years ago), but in fact the site was dug badly, many years ago, so its portable art objects may be more recent, although still of the Ice Age. Photo A. Marshack, and courtesy of the P. Bahn collection. 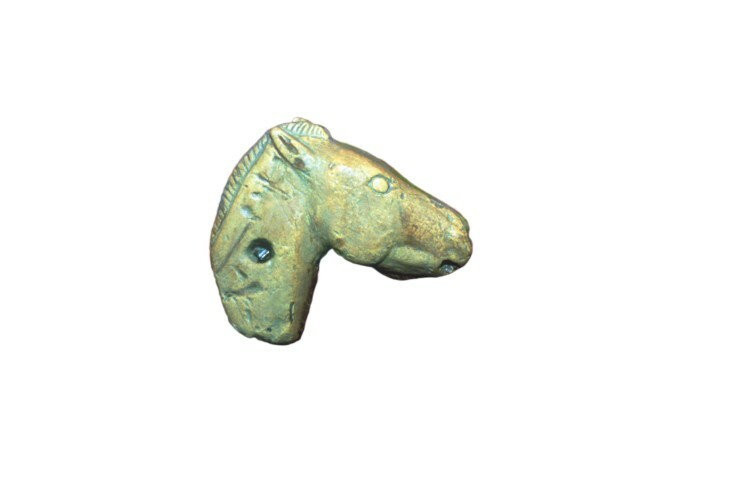 Horse-head carved in limestone, from Duruthy (Landes). Magdalenian. Length: 7.1 cm, height: 6.2 cm. This Pyrenean rock-shelter contained a series of horse carvings in a kind of ‘horse sanctuary’ dated to the 14th millennium bp; the biggest, a kneeling sandstone figure, rested against two horse skulls and on fragments of horse-jaw, while three horse-head pendants were in the immediate vicinity. Featured image credit: Rock painted panel with figures of bison in the cave of La Covaciella, Spain by Locutus Borg. Public domain via Wikimedia Commons. Paul G. Bahn is a leading writer, lecturer, translator, and broadcaster in the field of archaeology. In 2003, he led the team that discovered the first Ice Age cave art in England, at Creswell Crags in Nottinghamshire. He has been freelance since the mid-1980s and regularly leads lecture tours to, among other places, the famous decorated caves of Europe. 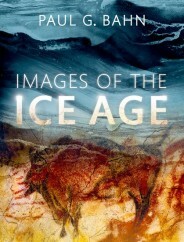 His latest book is Images of the Ice Age (OUP, 2016).